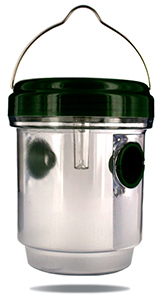 This mosquito trap will stop pests without the need for chemicals or electricity! Spending time outdoors in warm weather is one of life’s greatest pleasures; whether it’s camping, a picnic or just sitting quietly in your garden. Unfortunately, warm weather means pests like mosquitoes, flies and wasps. Spray on insect repellents often contain harmful chemicals like DEET, which has been linked to respiratory conditions and other health conditions. Portable bug zappers require batteries or charging, making them inconvenient if you’re going out into nature. If you’d rather use a natural option, go back to basics with this insect trap – the design is highly effective and easy to take with you anywhere. By using a combination of blue light and the sweet liquid of your choice, it attracts mosquitoes, wasps, flies and other insects in and quickly exterminates them and it works during the day and at night too! The solar panel means that you don’t need to worry about having access to spare batteries or mains power, so it’s perfect for camping trips. It’s eco-friendly and safe to use around children so all the family can be protected from insect bites during the day and at night too.